Sometimes I'm a bit dozey! 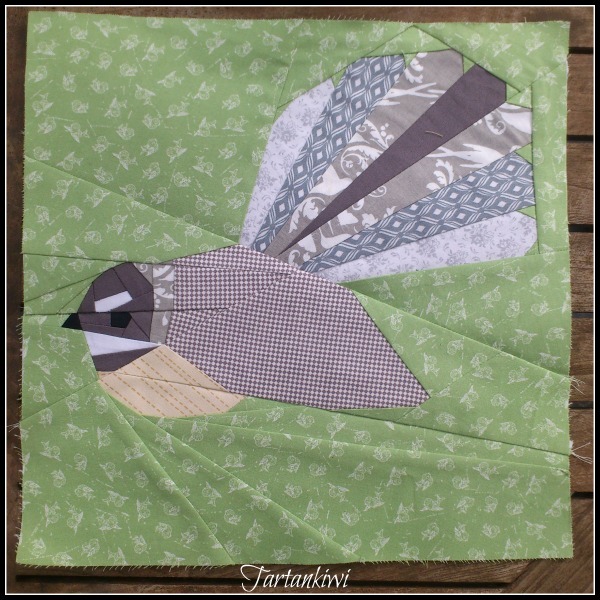 Like when I finished the fantail pattern and kidded myself that I had sent it to my pattern testers. I have to say that yet again I am torn about my fabric choices for this block. I love that the cheeky fantail who normally hops and skips around people, is surrounded by lots of cheerful flying birds. I love that many of the fabrics have a feather-like quality to them. I just wish that they were a bit brighter and less subdued/ old fashioned looking. Then just as I had almost finished piecing the fantail, I received a very polite email from Leonie (one of my pattern testers) asking whether I found someone else to test the fantail? There will be a slight delay while I get my act together and do what I was supposed to do... Have you done anything equally dozey recently? Oh that fantail is so purty! They're more of a 'NZer' emblem to me than a kiwi, I think. Um... I was in a rush to make my grey hoodie (too excited) and didn't leave enough ribbing for the wrists. So I put the wrist-part (technical term) together with the sweatshirt fabric, and it's just.not.right. Anyone looking at it wouldn't be able to tell, but the OCD in me want's to buy some more ribbing to make it right! Duh. so cute!! You are so patient to do this! Your fantail looks perfect. They are such cute birds with such big personalities - lovely! Another great pattern :-) I am loving the series, NZ has a lovely variety of native birds and hat a great way of sharing with the world. Ooops!! lol.....such a cute pattern....my fav!